Well guess what ya’ll, I did it! 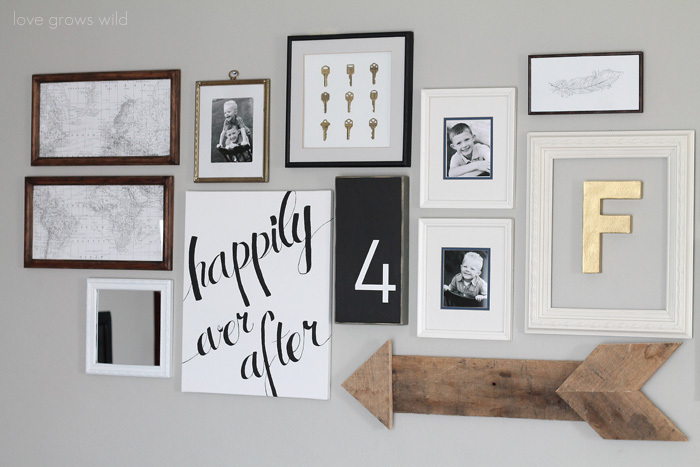 A large, 14-piece gallery wall complete with cherished family photos, unique thrifted finds, DIY artwork, and a pallet wood arrow that I’m BEYOND smitten with… all for UNDER $20!! Yes, I said $20! 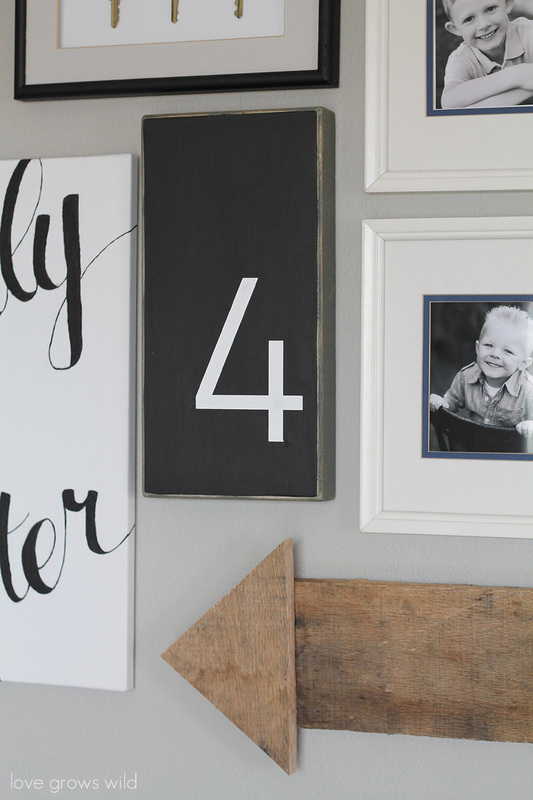 You definitely don’t want to miss these gallery wall ideas PLUS my easy hanging trick! 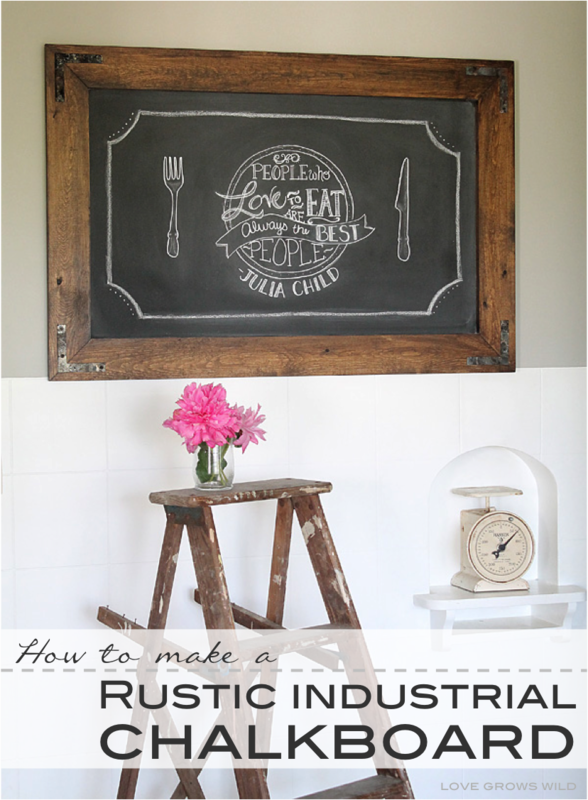 Step 1: Shop, Thrift, Re-use, and Upcycle! 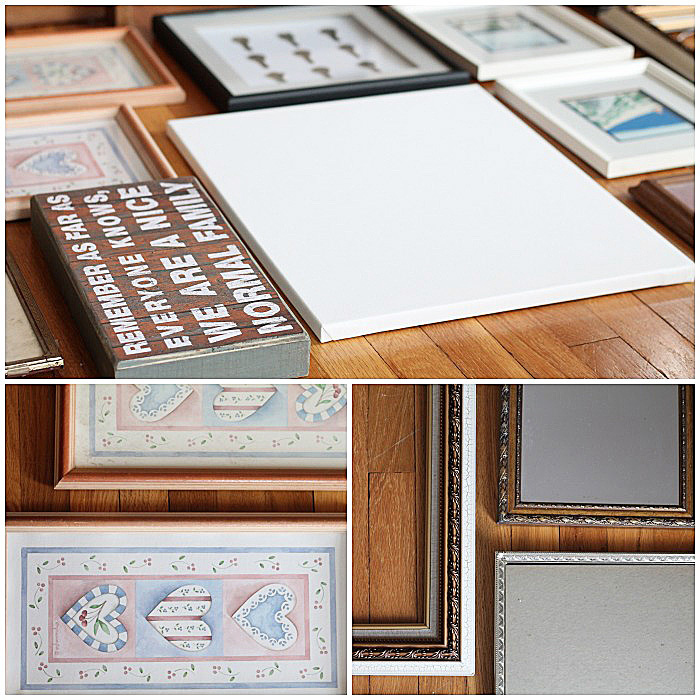 My first task was to shop around at thrift stores for old frames. I hit up Goodwill and scored probably 6 or 7 good size frames for around $20. 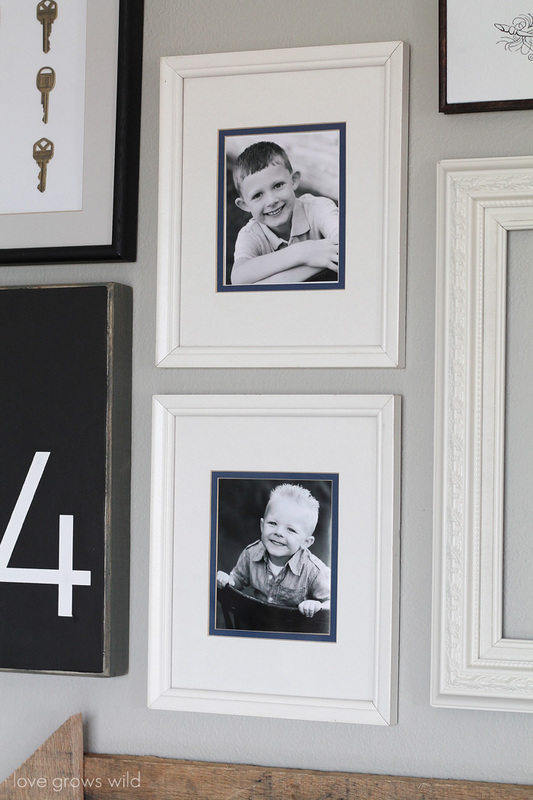 I made sure to pick a variety of sizes and materials, such as metal and wood, that I knew I would create interest on the wall. 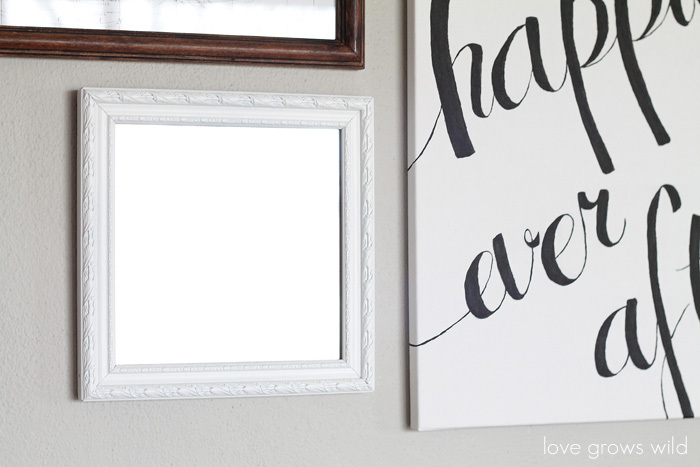 When you’re looking for frames, don’t forget that you can easily spray paint them to whatever color you desire! 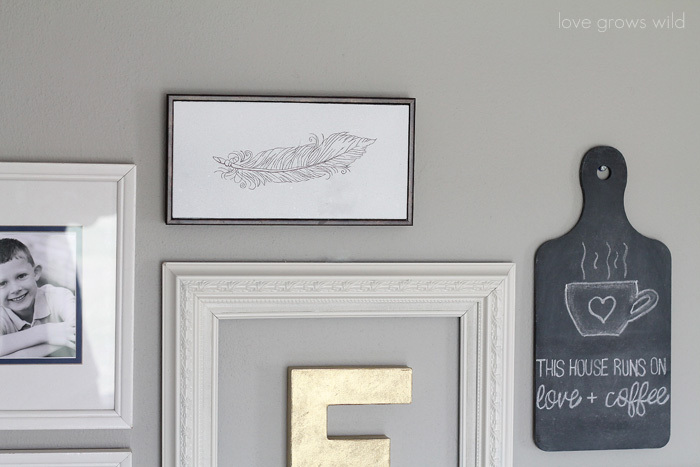 I brought everything home and laid them out on the floor, adding a few pieces I already owned… a blank canvas, my framed key specimen art, a small chalkboard, and a few small signs that needed a makeover. This was a great chance to clean out my closet and use up some of the items that I’ve had sitting around for awhile! 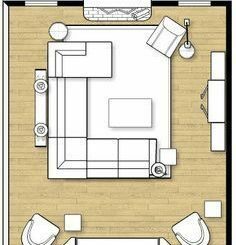 I measured the wall above my couch and arranged the frames on the floor to those dimensions. Then I grabbed a piece of notebook paper and sketched out what I wanted to do with each frame. I sprayed a lot of them white to keep the wall light and spread a mixture of black, gold metal, and wood tones throughout the remaining pieces. 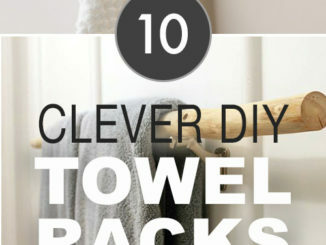 Step 2: Hang it up! 1) First, I traced each frame on paper and cut the shape out. 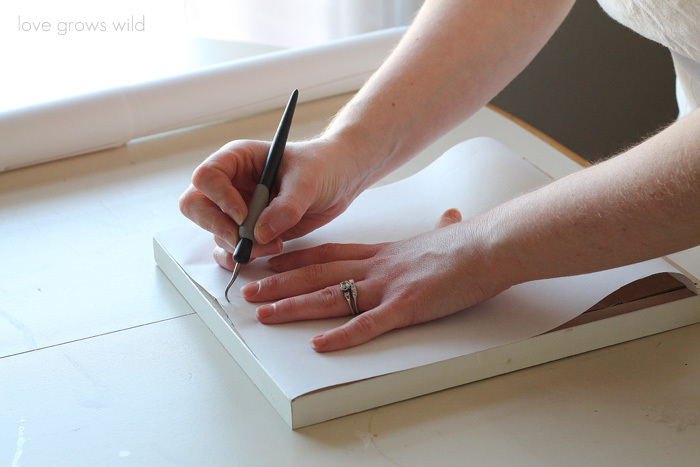 Any scrap paper will do… newspaper, brown paper bags, or even wax paper. I had a roll of white drawing paper, so I went with that. 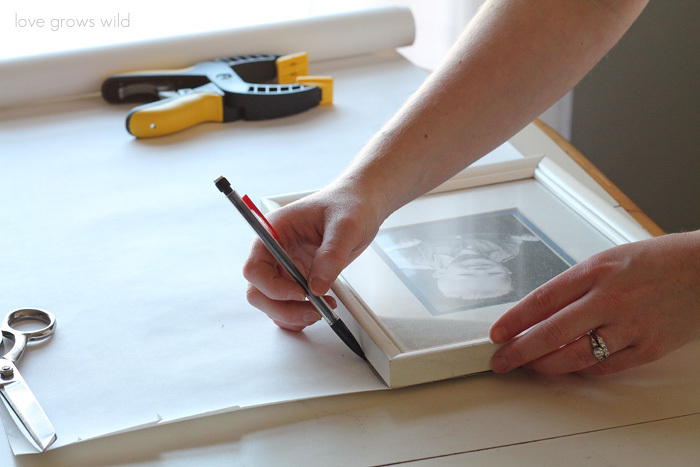 2) Then I placed the paper on the back of the frame and made a hole where the nail should go. 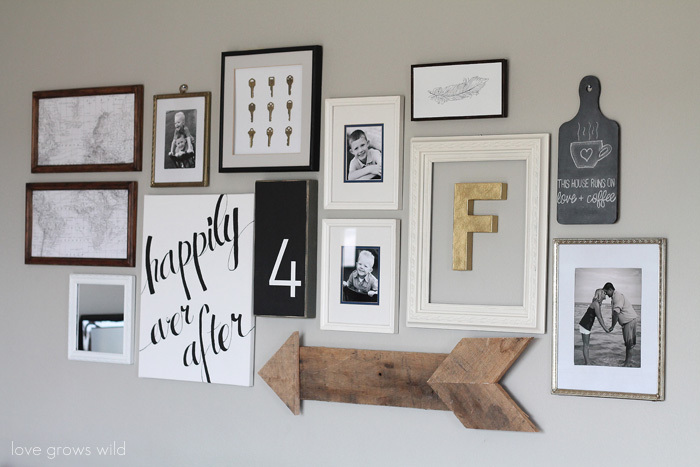 3) Then came the fun part… arranging everything on the wall! 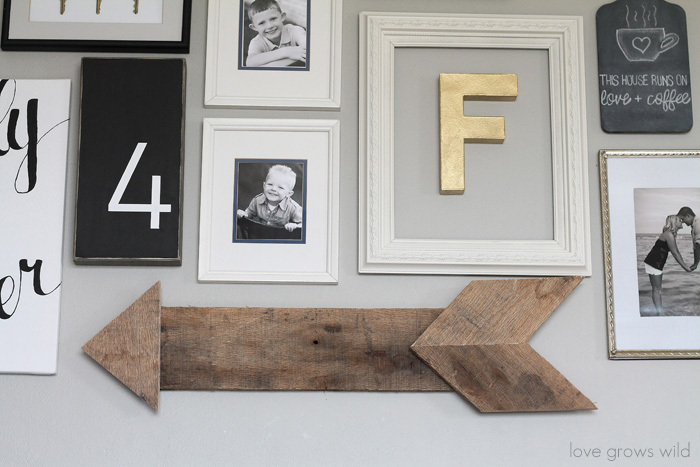 The easiest way I’ve found to do this was to first mark off the area where you want your frames to go. 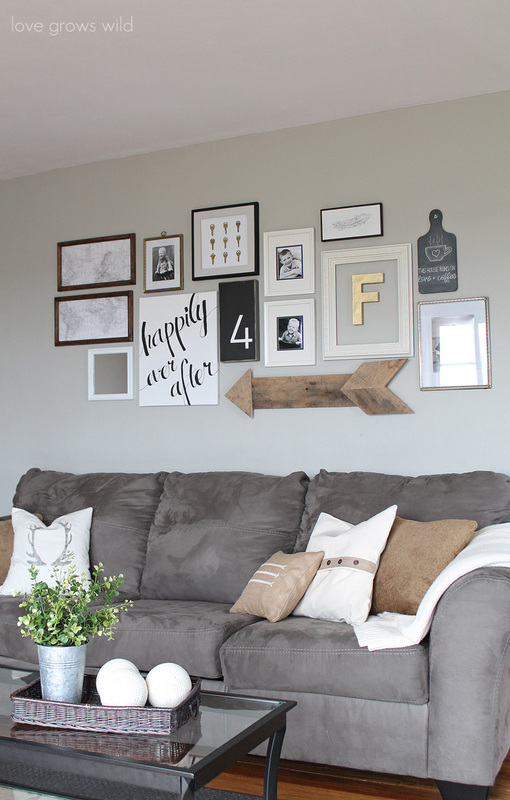 My frames took up about a 7′ x 3′ space, so I found the center of the wall and how far above my couch I wanted the frames to start and used masking tape to create a 7′ x 3′ box on the wall. I didn’t have any exact measurements on the spacing of each frame, so I just eyeballed where I wanted each paper to go. I started with a paper from the center and worked my way out from there. 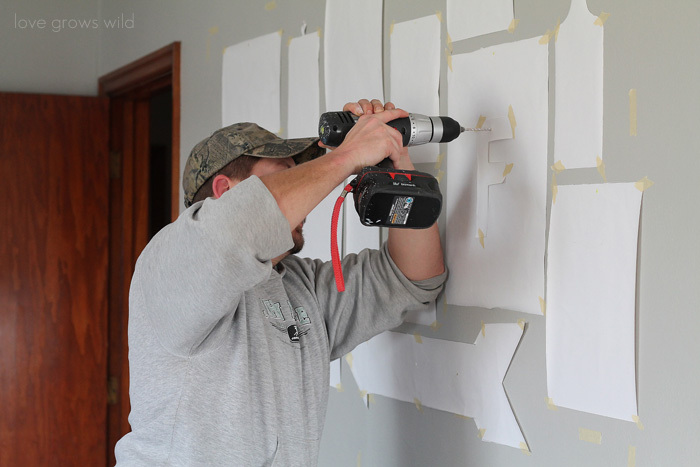 4) Once I had all the papers in place, we drilled through the hole in each paper to add an anchor and screw in the wall. Our house is on the older side, and these walls are TOUGH to drill through. Simple nails either bend or just tear up the wall, so my husband used a masonry bit and wall anchors to make sure everything stays where it’s supposed to. 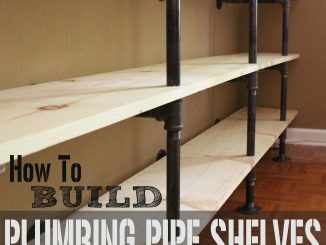 Even though our walls are a pain to drill through, it was SUPER easy to find each screw placement because of the handy templates I made! No guess work, and no 1,000 holes in the wall! 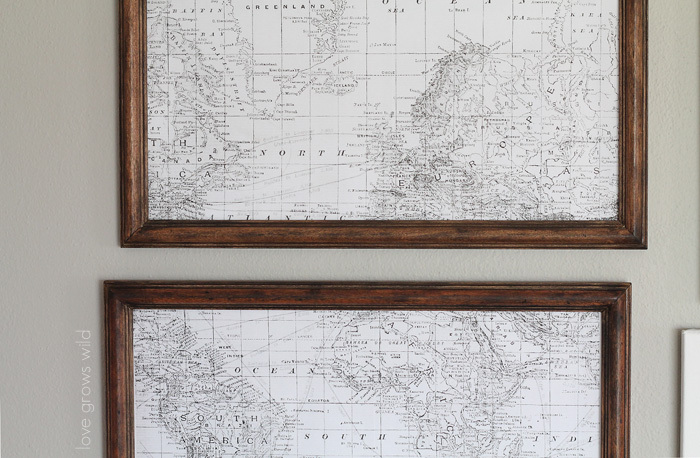 I tore all the tape and paper down and hung my frames on the wall. 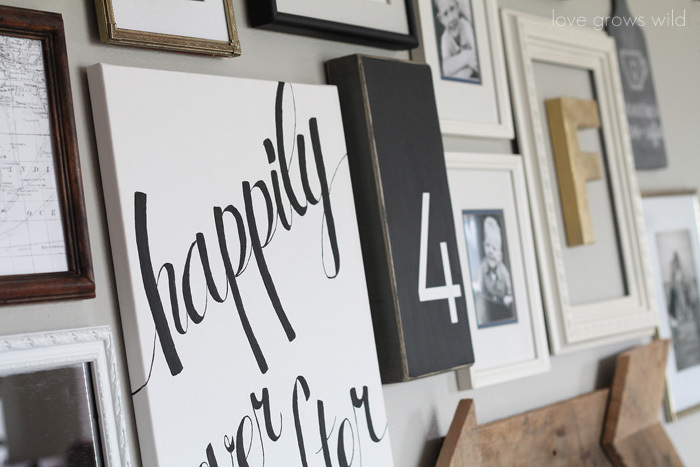 Now every time I walk into my living room, I get to swoon over this gorgeous gallery wall! So what do you think? I’m dying to know… what’s your favorite piece?? Is there a certain one you’d love to see a tutorial on? I have step-by-step tutorials lined up for a few of the pieces in the next couple weeks, so leave me a comment and let me know which individual projects you’d like to see! 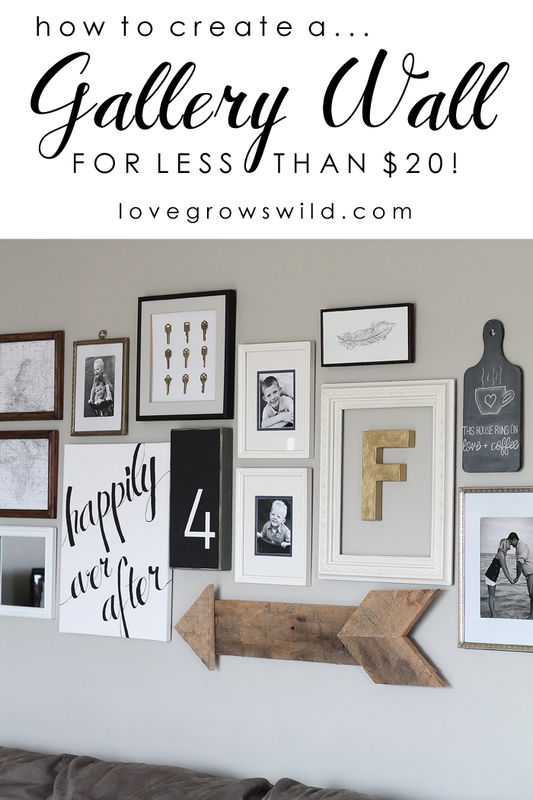 So I told you this gallery wall cost under $20, right? 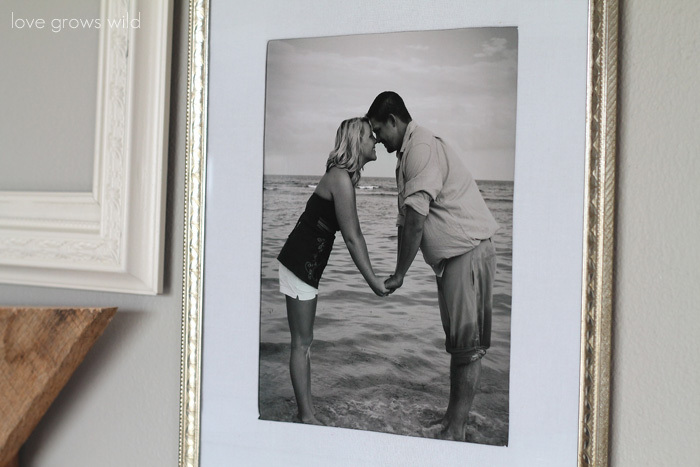 Well here’s a little breakdown on how I kept such a tiny budget to cover a ton of wall space: I mentioned earlier that I spent about $20 in frames at the thrift store. I didn’t end up using all of them so a few will be re-purposed for another project. 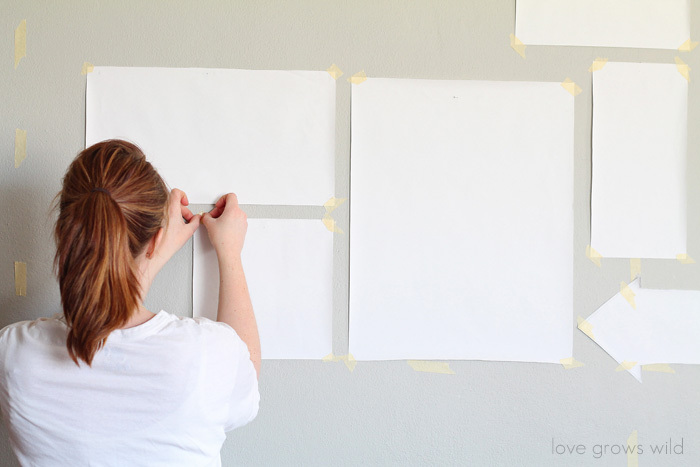 I already had the big white canvas from a two-pack I bought awhile ago. 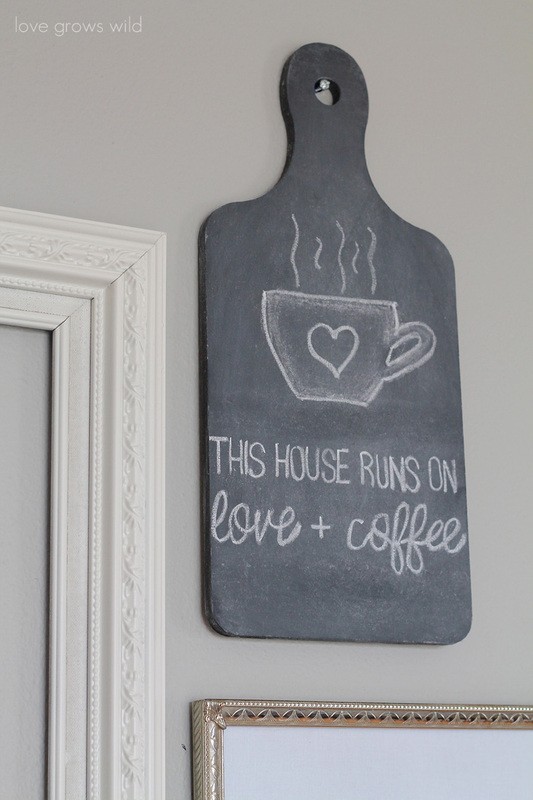 The small chalkboard I already had from a kitchen project, and I painted over a few small signs that didn’t fit my style anymore. 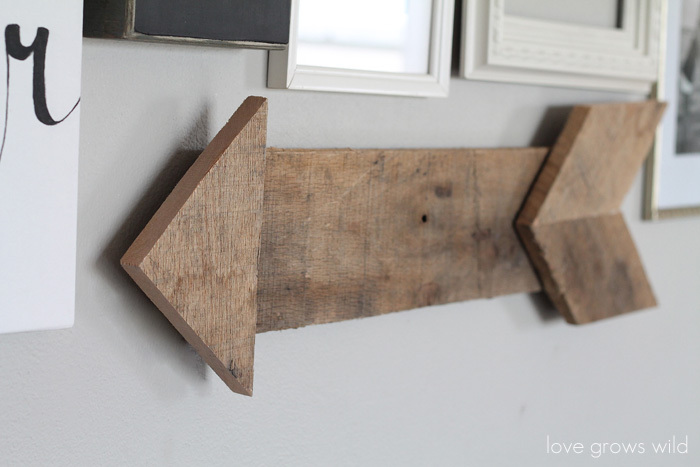 And the wood arrow was made from a pallet that my sweet sister picked up for me. Best. Sister. Ever. 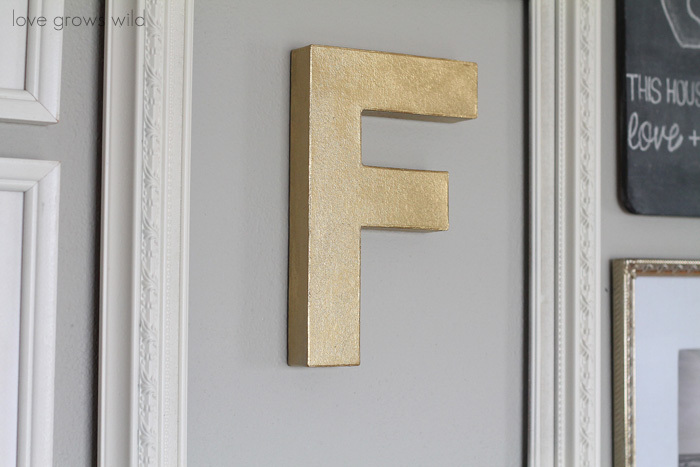 I had plenty of spray paint, stain, markers, and those sort of supplies on hand, so the only other thing I purchased for this wall was a paper mache letter F. That’s it! 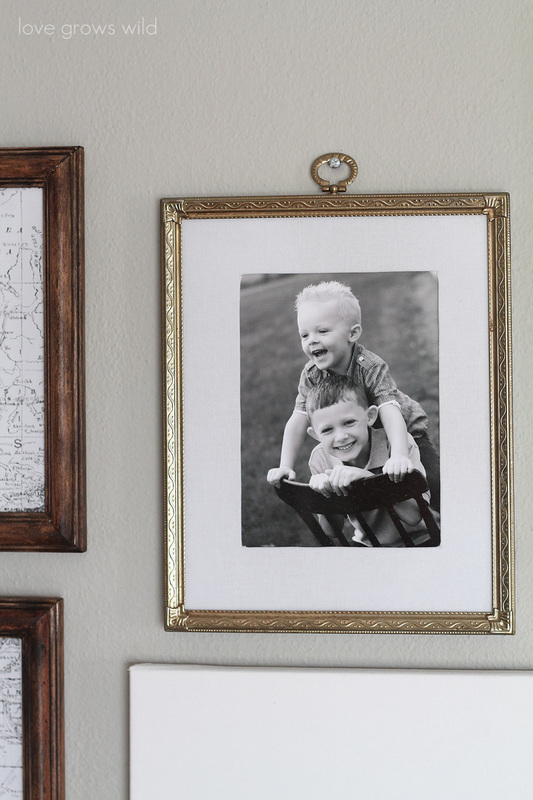 A little spray paint and some thrifted frames can go a LONG way, my friends! 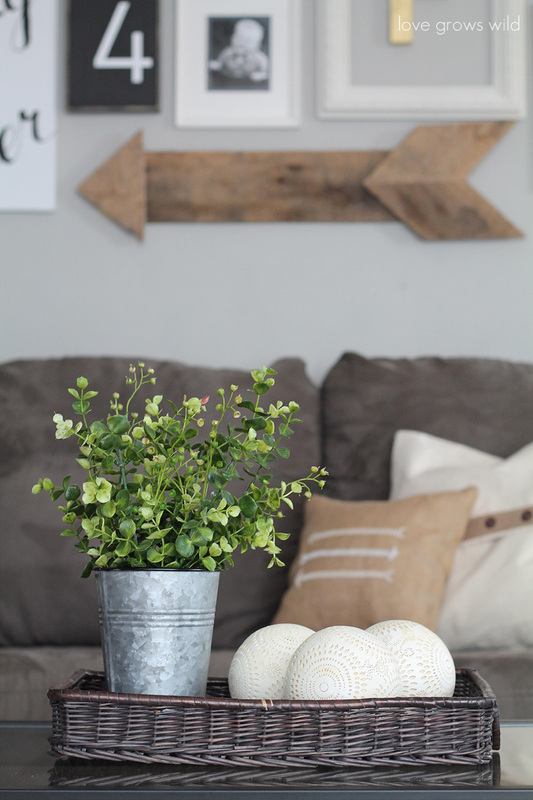 I’ve never shown much of my living room here on the blog before (mostly because there’s so much I want to work on), but I thought I’d give you a little peek at what everything looks like. 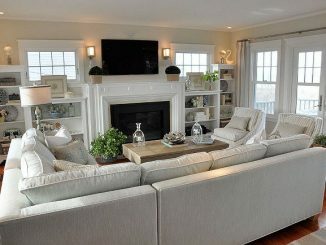 Woodlawn Colonial Gray walls with a simple, darker gray couch and a cream and gray stripe rug. Can you tell what colors I like? Lol! I used to have a big, dark wood coffee table, but it was too much dark furniture for me, so I switched it out for a simple glass coffee table with a black frame from Walmart that I really love. The glass gives an airier feel to the space. I’m constantly switching out pillows on the couch (chronic re-decorator right here! 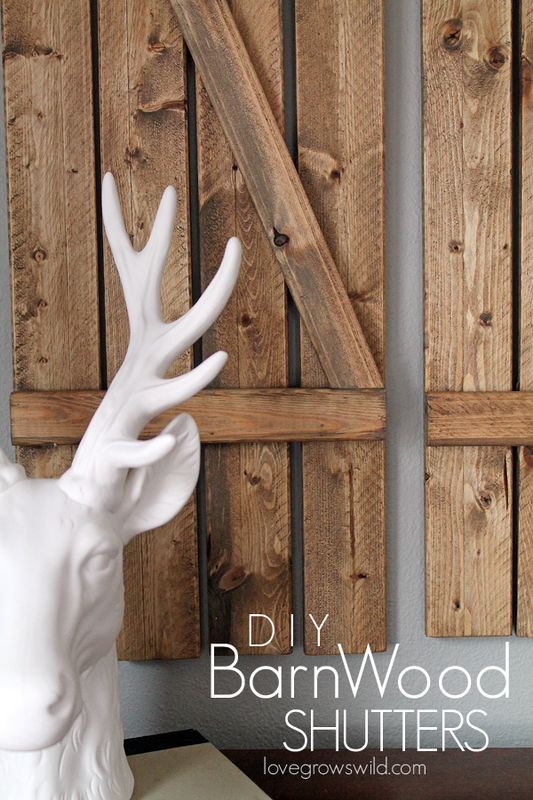 ), but right now I have a few solid color clearance finds, an adorable antler pillow from Parris Chic Boutique, and some of the easy DIY pillows I made awhile back. Click here to check out those tutorials! 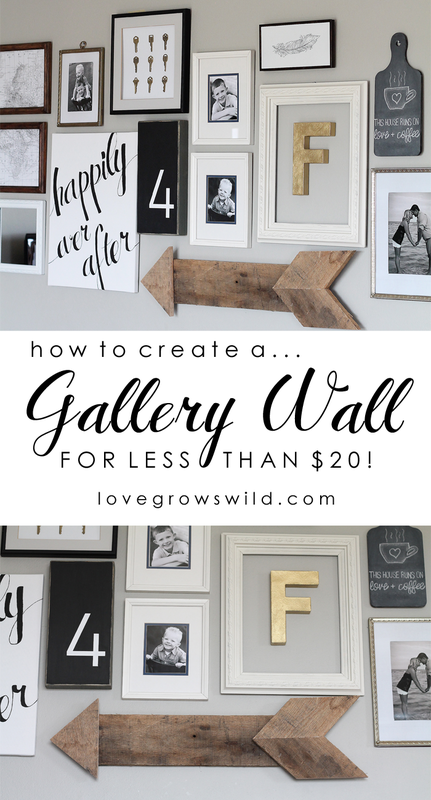 As I said before, I’ll be sharing tutorials for some of the pieces in the gallery wall coming up, plus a few furniture makeovers and more fun living room updates! 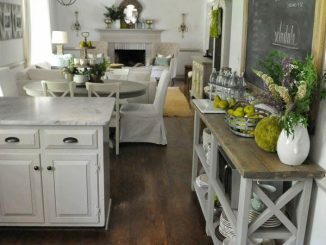 I just love how my living room is shaping up! 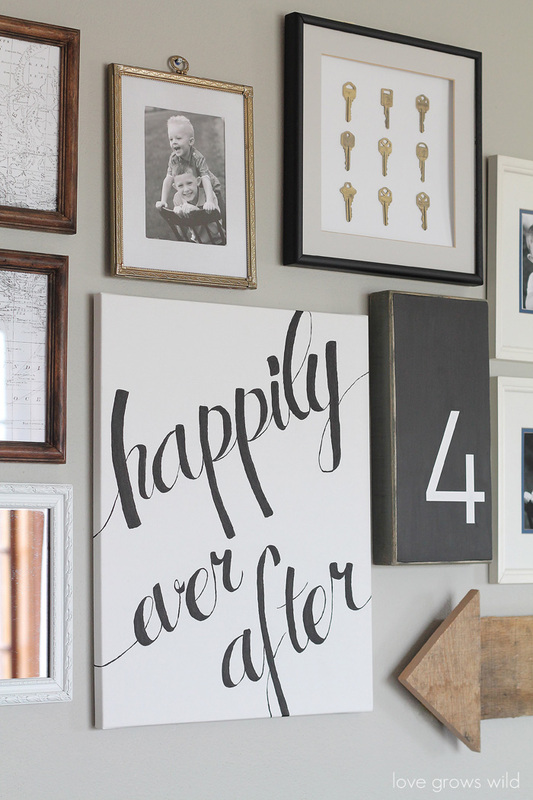 If you’re reading this, thank you for sticking around through tons of photos, and I hope you’re inspired to create a gallery wall in your home too! 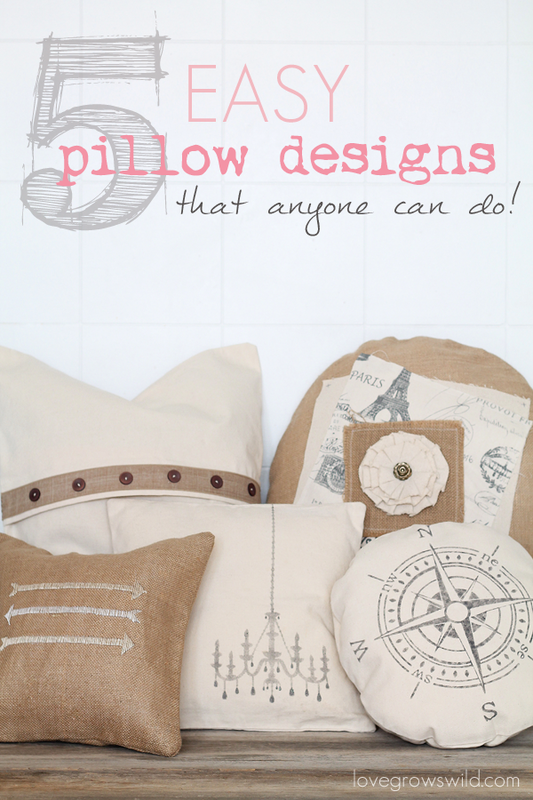 5 Easy Pillow Designs that ANYONE Can Do! 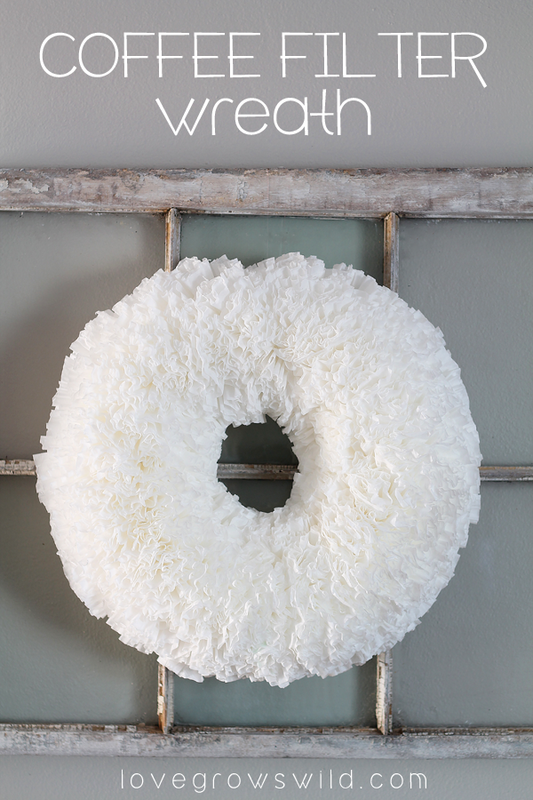 20 Dashing Current Living Room Furnishings to Perfect Your Condo!